Io, [eye-oh] or [eey-oh], is the fifth of Jupiter's moons and the third largest. It is just slightly larger than Earth's moon. Io is named after a maiden who was loved by Zeus. In the Greek myth, Zeus turned her into a heifer in an attempt to hide her from his jealous wife, Hera. 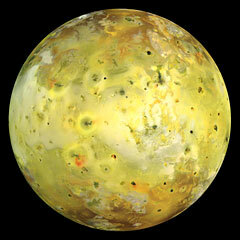 Io was discovered by Galileo Galilei and Simon Marius in 1610 and is one of the four Galilean satellites. Nearly everything we know about Io was learned from the Voyager and Galileo missions. Io is without a doubt the most bizarre-looking object to be discovered by the Voyager spacecraft. It is unlike any other moon in the Solar System. The surface of this moon is pockmarked with more colors than could have been imagined. Most of these features are believed to be formed by sulfur and sulfur compounds at different temperatures. Astronomers had expected to see impact craters when the first pictures came in from the Voyager probes. Instead, they were shocked to find that Io has almost no craters. The surface is extremely young, and is constantly reshaping itself. 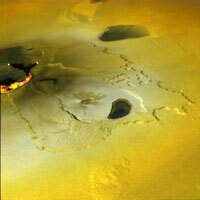 The most surprising discovery on the Voyager mission was that of active volcanoes on Io. 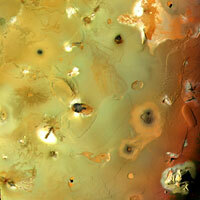 Io's surface is littered with hundreds of volcanic calderas. Voyager sent back images of active volcanoes spewing sulfur hundreds of miles into space. Observations with the Hubble Space telescope are constantly turning up new volcanic eruptions. 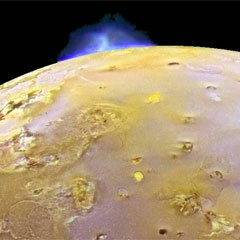 Io is the only body in the Solar System besides the Earth known to have active volcanoes. This mosaic image of Io's surface was assembled from images acquired by the Voyager 1 and Galileo spacecraft. The surface of Io is covered by a number of strange features. It looks more like a pizza with "the works" than a moon. The most striking features are the volcanoes. 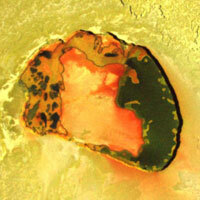 Astronomers believe that Io is caught in a process known as "tidal pumping". It is constantly being pulled by Europa and Ganymede, and then pulled back in its orbit by Jupiter. This "tug-of-war" is literally pulling the planet inside out. This process distorts Io's surface by as much as 330 feet (100 meters). The friction caused by this process creates a lot of heat within the small moon. It is similar to the way a coat hanger heats up when it is bent back and forth. Other strange features of Io include lakes of molten sulfur, non-volcanic mountains, volcanic vents, and lava flows hundreds of miles long. The sulfur and various sulfuric compounds are responsible for the varying colors on Io's surface, giving it a mottled look. Astronomers once believed Io to be composed mainly of rocky material with very little iron. 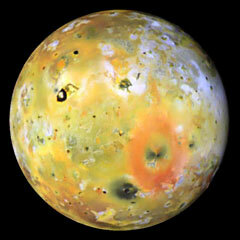 But recent discoveries by the Galileo probe show that Io has an enormous iron core that takes up nearly half its diameter. A newly discovered hole in Jupiter's magnetic field is leading astronomers to speculate that Io may have a magnetic field of its own. If so, it would be the first moon known to have one. Io also has a thin atmosphere of sulfur dioxide with traces of other gases. Unlike the other Galilean satellites, Io has almost no water.